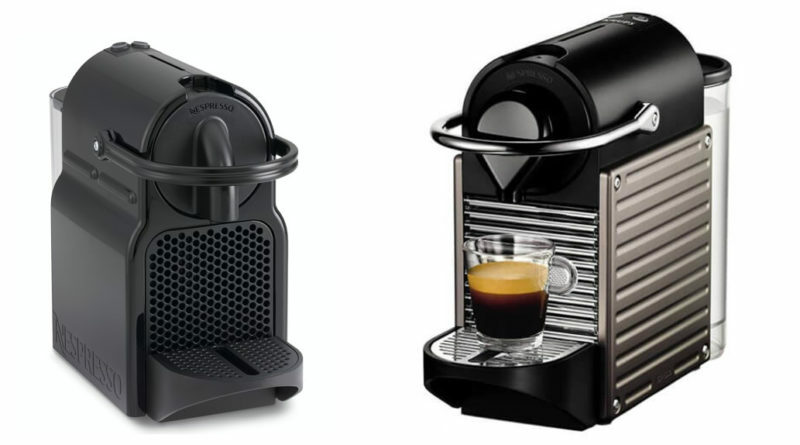 Nespresso Inissia vs Pixie which espresso maker is right for you? Both the Inissia and Pixie are single serve espresso makers that can make both espresso and lungo. They both use the older type capsules(originalLine) from Nespresso, whereas more recent similar machines like the Evoluo or Vertuoline use the newer Vertuoline capsules. The Nespresso Inissia is a single serve espreso maker that can brew both espresso and lungo style coffee. It operates at 19 bar pressure and uses capsule or pod based coffee only. There are separate buttons for choosing either espresso or lungo. The Inissia has a 24 ounce water reservoir and can hold up to 11 used capsules in the used capsule container. ​The drip tray is adjustable so it can accommodate larger cups sizes for when you are brewing tall drinks. The Nespresso Pixie shares a lot if not all of the basic features of the Inissia above. It has the same pressure, water reservoir and type of drip tray. It has a slightly larger form factor than the Inissia but it is hardly noticeable. Feature wise the Pixie has a slight edge. You get an low water reservoir warning light which is not found on the Pixie. ​There is also no power button unlike on the Inissia. So you have to rely on the auto-shutoff feature entirely. Nespresso Inissia vs Pixie which is the better joice? The Pixie can be best described as a face-lift model to the Inissia. It has fewer plastic parts internally, has a low water light indicator and ​design wise the Pixia is a much sleeker looking machine especially with the metallic trim.